The ability to analyze multiple genes at the same time has led to the estimate that 20% to 25% of women with ovarian cancer have an inherited mutation in a cancer-predisposing gene. In the past few years, some of the classic phenotypes and associated cancer risk estimates of inherited cancer syndromes have been questioned. This is due partly to increased access to genetic testing as well as to the availability of next-generation sequencing (NGS) panels for inherited cancer. The ability to analyze multiple genes at the same time has led to the estimate that 20% to 25% of women with ovarian cancer have an inherited mutation in a cancer‑predisposing gene. 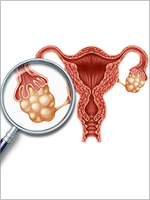 Although this association has been noted for a while, until recently there was not enough data available to determine the lifetime ovarian cancer risk for women with a mutation in some of these genes. Multiplex genetic testing in BRCA1/2-negative cancer patients with in-person genetic counseling allows informed decision-making while decreasing short-term anxiety, according to data presented at the 2015 San Antonio Breast Cancer Symposium. Prostate cancer is the most common nondermatologic cancer in males in the United States.1 Incidence and mortality rates vary significantly between countries. In the United States, the lifetime risk of developing prostate cancer is approximately 1 in 7, with an incidence similar to that of breast cancer. The association of POLE and POLD1 with colorectal cancer risk was demonstrated in 2013. Palles and colleagues studied families with a dominant pattern of inherited colorectal cancer and multiple adenomas through whole genome sequencing. The number of genes associated with breast cancer risk continues to increase. Recently, through whole exome sequencing, 2 groups of researchers have demonstrated that mutations in RECQL increase the risk of breast cancer. The Oncology Nurse–APN/PA conducted an interview with Jennifer Temel, MD. The written interview is based on a presentation at the 2015 Annual Meeting of the American Society of Clinical Oncology, Phase III Trials for Anamorelin in Patients with Advanced Non-Small Cell Lung Cancer (NSCLC) and Cachexia (ROMANA 1 and 2). Pancreatic cancer represents 3% of new cancer cases each year, with the average age of diagnosis being 71 years. Inherited Ovarian Cancer: What Have We Learned? Due to the high mortality rate and lack of effective surveillance methods, identifying women at increased risk for ovarian cancer is crucial for offering risk-reducing procedures.